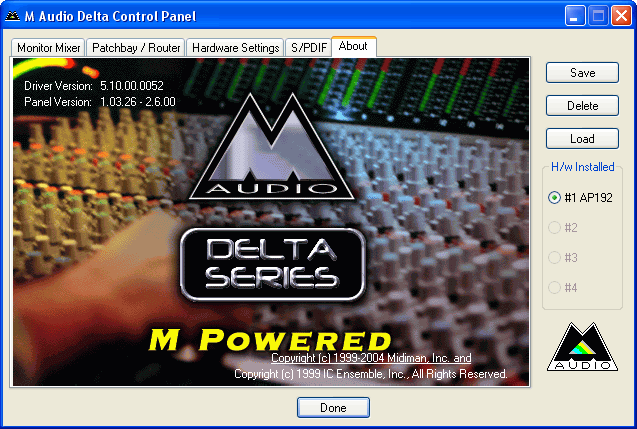 The M-Audio Audiophile 192 professional sound card was announced late in 2004. The "Audiophile" name was succeeded from the previous model, Audiophile 2496. But nevertheless this product is not intended for audiophiles. Balanced TRS connectors and the Delta series indicate that Audiophile 192 is a modern and affordable professional sound card for a home/project sound studio. A single PC can host up to four such cards. Two analog inputs and four analog outputs are card's key feature, so let's take a closer look at them. Main Outputs 1/2 (1/4" TRS) support balanced/unbalanced connections. 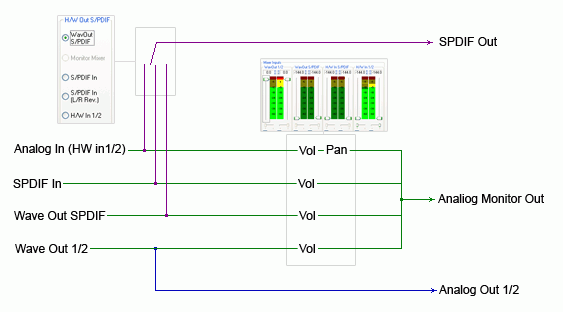 Output signal is strictly assigned to the first MME device and is designed for connecting mixing consoles, headphones amplifiers, and recording devices. Its volume is fixed at maximum and cannot be changed. Monitor Outputs (1/4" TRS) support balanced/unbalanced connections. Output signal is defined by card internal hardware mixer (can monitor signals from digital and analog inputs/outputs) and is designed for connecting active monitors. Is a dedicated output really a plus can be questioned. 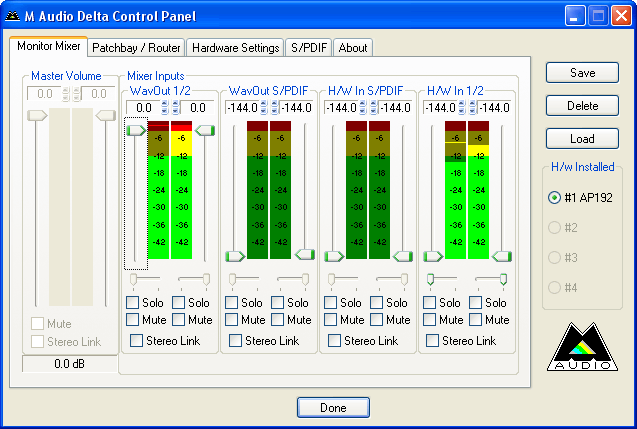 Given the card is connected to an analog mixer, it solves the problem of separating and adjusting headphones and monitor signal levels. 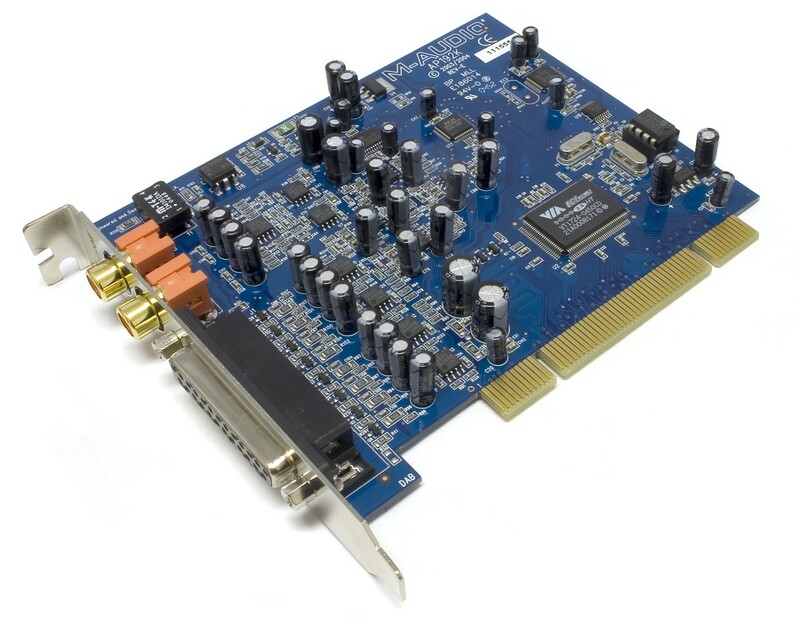 As for the enhanced routing and mixing capabilities, these are not that demanded from an internal stereo sound card. We suppose a dedicated headphones amplifier (like that of M-Audio Revolution 5.1 or ESI MAYA 44) would be more useful. Converters are the same as those of ESI Juli@, alike in operation. And again about the 8-channel DAC. This gives a capability to monitor digital and analog inputs/outputs completely on the hardware level of DAC stereo channels, signals mixed the analog way without passing through PC. The control panel appearance is similar throughout the entire Delta series. 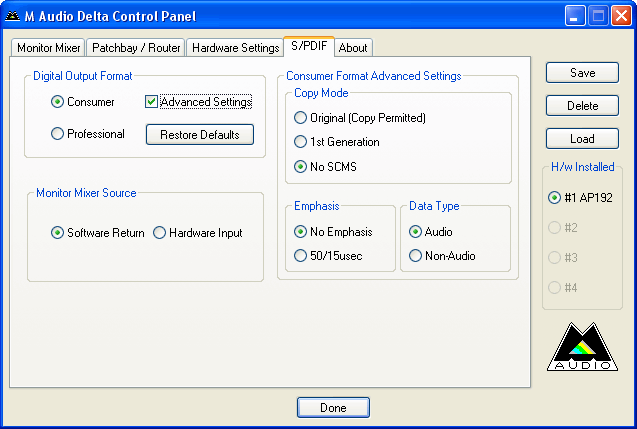 Card mixer is unified, which simplifies controls for an experienced user. The disadvantage is that settings are mixed up and scattered about the tabs. Signal monitoring and routing are not intuitively understandable, so one might have to look into the manual more often than expected. ESI Juli@ has a more comfortable control panel. For your comfort Roman Kuznetsov drew a signal-flow diagram. "Vol" means level control, "Pan" is for panorama. Images show mixer tabs corresponding to units. Thus the second hardware channel WavOut S/PDIF can be used as an independent analog monitor output, which transforms the card into a fully-fledged 4-channel solution with 2 independent stereo outputs. 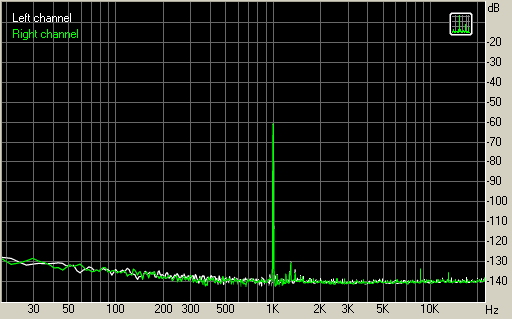 If you raise the volume of WavOut S/PDIF and mute everything else you will get a second independent stereo channel. If you set WavOut S/PDIF to minimum, adjusting WavOut 1/2 you will dub the first channel to both analog outputs. 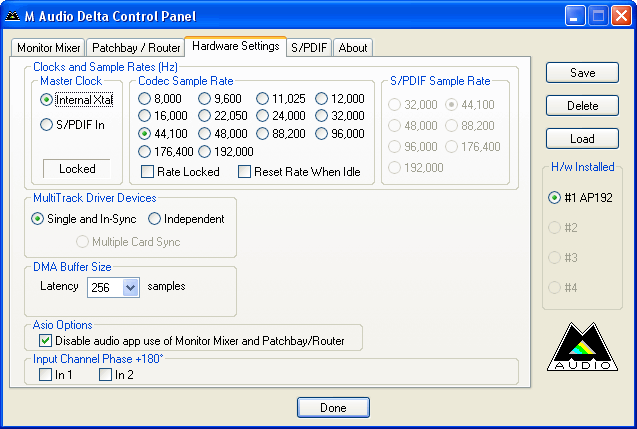 Another benefit of this card is its support for all possible sampling rates. We had a chance to test Audiophile 192 sending signal to the reference rack interface Lynx Aurora 8. This enabled us to obtain card output ratings. According to the specifications, Audiophile 192 analog output features 108 dBA SNR and 109 dBA dynamic range. The vendor honestly provided the actual card output ratings instead of DAC ratings. The results in different PCs may vary due to different motherboard and PSU models, and external noise pickup. The results are nearly the identical to those of ESI Juli@. After all, these cards feature the same converter chips. The analog input features higher-quality converters rated at 113 dBA. As we can see, loopback test results are bottlenecked by DACs. It's not a problem of RMAA, but a problem of this measurement technique. To obtain more adequate results one will need a higher-quality reference device. However, by connecting input to output we can: 1) obtain approximate values; and 2) discover noise pickups and optimize wire pass-through. For auditions we used near-field studio monitors ADAM S2.5A, Proel professional microphone cable with gilded connectors. We also compared M-Audio Audiophile 192 with ESI Juli@ and M-Audio Revolution 5.1. All of these feature the same DAC - AKM AK4358. Cards were installed into the same PC. Comparison was conducted by momentary cable switching. All three sound cards perform on the same level and differ only by nuances. ESI Juli@ (balanced TRS connection) is a leader in details, attack and stereo panorama. Audiophile 192 yields a bit, but still performs better than M-Audio Revolution 5.1. Remember, these differences can be heard only on rather high-quality acoustics and hardly show up on inexpensive active stereo speakers or entry-level monitors. It's interesting that, when reviewing Audiophile 2496, I also preferred a product from ESI - Waveterminal 2496. M-Audio Audiophile 192 sound card is an inexpensive professional solution mostly important for users in need of additional analog output. The closest rival, ESI Juli@, features a more intuitive control panel and provides unbalanced RCA connectivity. In everything else these cards are similar. Perhaps, compatibility with ProTools M-Powered will become a deciding argument to Audiophile 192.